Sarita Handa expands her home furnishings brand to Mumbai with a luxuriously appointed store. 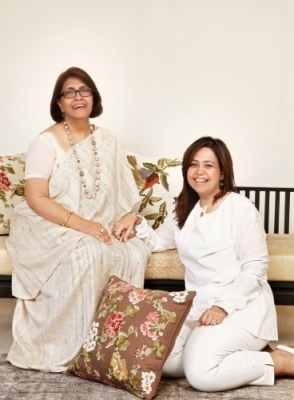 Sarita Handa has been in the business of home furnishings since the last 20 years. Her company has been manufacturing exquisite products for brands such as Pottery Barn, Macy’s, Zara Home and Bloomingdale’s. Two years ago, her brand launched its first retail store in Khan Market, New Delhi, followed by a flagship store in the capital on MG Road. Now, Sarita Handa’s brand has expanded to Mumbai, with the launch of a 2,500 sq. ft. store at Shakti Mill Lane, Mahalaxmi, Mumbai. Saria Handa brand offers quality beddings, quilts, place mats, bath products, pure fibre fabrics, cushions, etc. Sarita Handa, the force behind this multi-million dollar company, has achieved international recognition for her aesthetics and superior quality. Suparna Handa, Sarita’s daughter, is involved in furthering the growth of the brand. “We have always been in the business of creating classics and Sarita Handa is all about timeless designs made with uncompromised craftsmanship. Our dedication to this vision has taken us from a leading manufacturer of textiles to a well known retail brand. And with the onset of 2015, we are proud to take it to the next level as we unveil our Mumbai store,” said Suparna Handa, Brand Director, Sarita Handa. Their new store in Mumbai is designed by Livin’ Colors Design. There’s a banyan tree in the little courtyard. An antique stone Buddha sculpture stands at the entrance, lending a peaceful old-world charm to the place. The big and impressive store enjoys plenty of natural light and features an eye-catching hanger-like industrial ceiling. It also has a multi-level mezzanine floor. “The store showcases new designs: modern, fresh, relaxed, and is influenced by everything from rustic houses to chic urban homes. Colour palettes are warm and neutral in tone and more organic in feeling, ranging from earthy neutrals to fashionable greys to dark rich mochas. Fabrics with sheen, offering hints of glamour, are entwined throughout the collections,” said Capt. Rahul Puri, Executive Director, Sarita Handa. Among the brand’s latest offerings is an extensive range of rugs, kilims, antique Persian carpets, as well as wall art and paintings by both young and established artists. Also available in various sizes and colours are new bedding ensembles with hand-detailed decorative pillows. There is also a completely new collection in signature Sarita Handa fabrics for drapery and upholstery; jacquards, textured and embroidered fabrics at the Mumabai store. Decorative pieces like the all new bronze statue collection are another highlight here. The Mumbai store is also home to cane daybeds, dining tables, chairs with embroidered backs, consoles, beds and side tables in teak wood, oak wood and reclaimed wood. The Sarita Handa store is located at 36, Ground Floor, Laxmi Woolen Mill Estate, Shakti Mill Lane, Off Dr. E. Moses Road, Mahalaxmi, Mumbai. Tagged Decor, Interiors, LifeSpice, Photo Gallery, The Pad. Bookmark the permalink.